A. You have already installed an AS ABAP 7.5x version, and just need to update the license. First,download the ASE license file from the link above. I am currently trying to set up a new AS ABAP 7.51 SP2 virtual machine. Is the procedure for a new installation still to extract a bunch of .tar files, replace the license file, compress them again and then start the installation? Like it is described in this comment. The procedure hasn’t changed, so if that worked for you, then it shoudl also work now. However, I haven’t tested this, since I installed my version before the ASE license expired. I’ll appreciate if you could do something about it. I am sorry about the delay. This was a known problem last week, which should now be fixed. Are you still getting the error with, eg, part 5? Hi Julie! Yesterday I downloaded all files with no problems. Yes! Good to know, thanks. How can I get the newest ASE license? The link that you provided i the blog takes me to the logon page. How can I get access to the newest licenses? The sharepoint link is broken. Maybe because the account of your colleague Ralf is deactivated. Could you please reupload the file? No, Ralf’s account is active. We are looking into this. I will get back to you all asap. ¿A que carpeta te refieres? En la carpeta s4installer tengo el fichero “SAP_COMMUNITY_DEVELOPER_License” este fichero no lo toco no? I am sorry I don’t speak Spanish. Is this a fair translation? Hello I have the date of the ASE license expired, but when I do option two of the blog that you attach to me in your answer “If necessary, update it from here: New Sybase license”, I can not do this step because it tells me ” That did not work We’re sorry, but mjcarzam@hotmail.com can not be found in the sap-my.sharepoint.com directory. Please try again later, while we try to automatically fix this for you. ” How can I solve it ?, and you could explain in more detail step three “NOTE: We do not have the resources to update the .rar files continuously. Therefore, if the version has been available for some time, it is possible that the license file has already expired. If so, put the new .lic file in the same folder as the script file, using the name SYBASE_ASE_TD.lic. You do not need to edit the .tar files. “, What folder do you mean? In the folder s4installer I have the file “SAP_COMMUNITY_DEVELOPER_License” this file I do not touch it not? Thank you very much and sorry for the inconvenience. Do you have a Sharepoint account? Step 3: Yes, I mean the s4installer, where the install.sh is located. The SAP_COMMUNITY_DEVELOPER_License is NOT the license to which I am referring. (That is a license to develop on the ABAP system.) The license you need is called SYBASE_ASE_TestDrive.lic . It is not normally not stored in s4installer, but deeper. However, in this case, since you are replacing the originally packed license, the install script expects it to be in the same location as the install.sh. We are currently having issues with Sharepoint, because the eligibility has recently been restricted. I do not have a sharepoint account. Сan i get a license for ASE Enterprise Edition Trial License for SAP Business Applications ? Hi Julie, Any update as to when the license will be available. I can’t install 751 due to the username error, which keeps pointing back to ASE license. Hi Andrew, I will let you know. We are working on this. Any idea about when the license will be available? Please check the new link and let me know. There is no dbexe.tgz-aa file :(. I think i might need it because i have a new installation. We can now download the new license and everything works perfectly. I do a new installation. 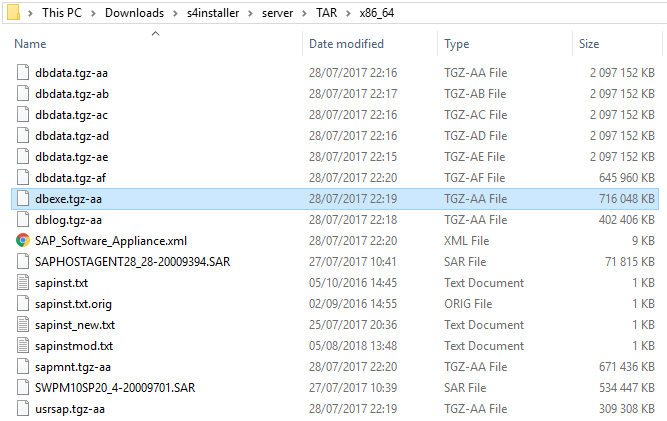 If you have problems with the files, it is better that you download and unzip all the .TAR files of this sap abap installation. In decompression, dbexe.tgz-aa file is generated. First of all, thank you for taking time to reply. I was trying to install the AS netweaver 7.50. I’ll download the one on your link and try to install it and let you know. Thank you Julie for your support. Hello Sandra, yes I saw that file in my folder but it was last modified 21/07/2016. Isn´t there a newer one ? However, we have now updated the install.sh script. Now, you should no longer have to follow the procedure by Julian Ramos. I have outlined the correct procedure above. I have not tested this myself but it has been tested by us here. Please let me know how you get on. Hat-tip toSandra Rossi, for jumping in here ;-). The link of ASE License has expired too. Trials and Downloads. Just search for “ASE License” and scroll down. I assume there is no other way to update the license for SAP AS ABAP Developer Edition than to access the hard drive and copy the files directly into the folder? I was thinking about the possibility with uploading a new license file through the slicense transaction. No, AFAIK, SLICENSE is for ABAP (ie application server) licenses only. This is the (ASE) database license, so the procedure is different. 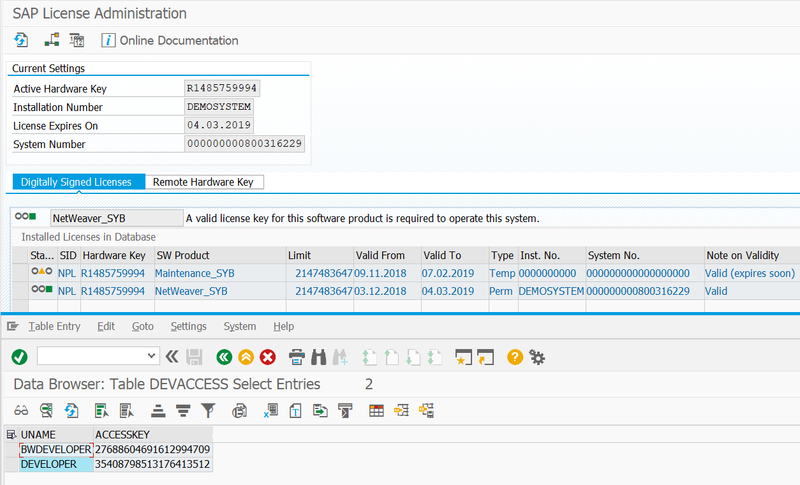 I’m working with SAP Netweaver AS ABAP 7.50 Developer Edition (installed on OpenSUSE), is there any possibility to add ERP 6.0 on the same environement to test SAP MM, PP, Finance modules ? If not what is the related product as Trial to download and how ? I am sorry but this is not possible. The idea of the dev edition is to help non-ABAP devs learn about the language and IDE, and to help older ABAP devs learn about new features in 7.5x. I had to use the Case B to install the mini sap, but now the Access Key 35408798513176413512 ( user DEVELOPER ) is not working. When I tried to use the this Key, the SAP shows a popup for incorrect entry. Is there another Access Key that I can use? Sandy Assum said to use this Access Key 12222845243181034647. I don’t know where he found this, but it worked. It was posted by Julie herself, it’s easy to find it. In fact these 2 keys seem to be possible since 7.50, but the right key seem to be provided by default since 7.51 so you don’t need to enter it, except if you don’t renew the license by deleting the old one and then installing the new one, if I have read correctly one Julie blog post. Here is my 7.52 license & dev key installed in December, I didn’t renew the license yet, and I didn’t need to enter the dev key after the fresh installation, I could write test programs immediately. I cannot find a working sybase license. None of the links are working they have expired. Could you please provide some help obtaining sybase license so that my installation can complete. My current license says it expires 2020 but I can still not use it for some reason. I tried this and got a bit further, but then I reached a point again where I could not find good information on my next problem. Caught ESAPinstExeption in module call: Validator of step. It keeps saying that I should start the installation without using SAPINST_START_GUI option. How do I opt the install script to run without SAPINST_START_GUI option? Will this solve my problem or is this just a symptom of something that I overlooked in the guide?